The less said about the United States’ Hexagonal-opening defeat to Honduras on Wednesday the better. While losing the opening game isn’t the end of the world – Mexico certainly didn’t look any better in drawing at home with Jamaica – it does give the team a wake-up call that qualifying for Brazil 2014 isn’t going to be a walk in the park. 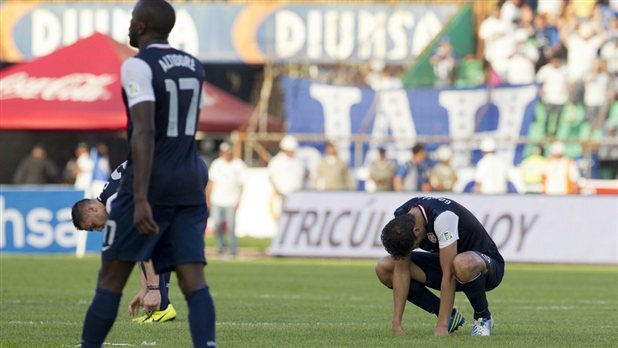 The loss was the USMNT’s first ever in a World Cup qualifier at Honduras, as well as the first time the U.S. failed to win its opening game in the CONCACAF Hexagonal. Throw in last year’s first-ever loss to Jamaica and it makes you wonder just what is going on. Wins against Italy and Mexico in friendlies is nice, but these are the games that really count. Luckily, this is just the first of 10 games for the team this year, so there is plenty of time (theoretically) to work things out. We should know pretty quickly if the team is up to the pressure. After facing Costa Rica in Denver on March 22, the U.S. travels to Mexico just for days later for a game where the El Tri will be looking for revenge after dropping that friendly at Azteca. If the U.S. can’t get three points off of Costa Rica, the pressure may be more than even Bradley can imagine.